It’s been an all-around awesome month. I hope you’ve been enjoying yourself as much as I’ve been enjoying myself. You can find Skye on Amazon and discover how love can develop between a woman who hides from her problems and a man who has never considered backing down. 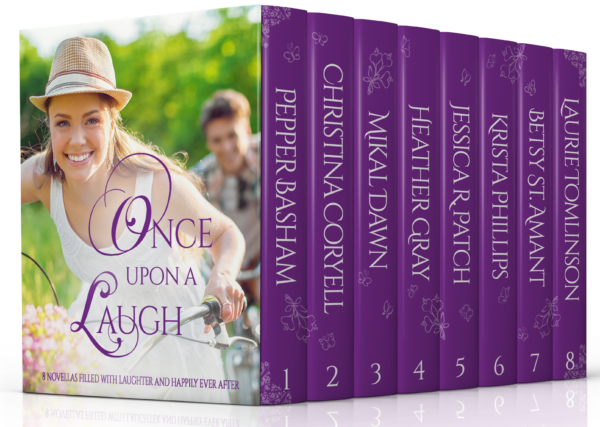 On top of the fun of Skye’s release, Once Upon a Laugh came out last week, and it’s full of fun — and sometimes funny — romance. My book, Definitely, is in the mix. I had a magnificent time writing that story. I laughed at poor Annie more times than is strictly polite, and I hope everyone who reads her story will get at least a chuckle or two out of it, too. Not just for any committee meeting, either. Oh, no. Not her. She wouldn’t settle for doing things halfway. If Annie was going to be late, she would do it up right. She would be late to a meeting for a committee on which the pastor was serving. Pastor Larkin had been with Trinity Community Church about a year. He didn’t know her at all. They’d never had more than a passing how-are-you-today conversation. Not that she’d been intentionally avoiding him. It had been subconscious. Definitely subconscious. What could she say? The man… unsettled her. And she hadn’t been able to put her finger on the why of that yet. Her foot nudged the gas pedal down closer to the floor. She could hear the upcoming Sunday sermon already. Being on Time for God. Uh-huh. Sounded like a winner. And everyone on the committee would be giving her the evil eye during the entire sermon. Not that God-fearing Christians gave the evil eye. They had a look, though. It was a mix of she’s-getting-what-she-deserves, bless-her-heart, and thank-goodness-it’s-not-me. The diner was finally in view. Time to think happy, cheerful, spiritually enlightened thoughts. After all, this was the day the Lord had made. She could choose to rejoice and be glad in it. Even if she was late. Rushing through the front door, Annie looked toward the big tables and didn’t see anyone from church. After eyeing the whole diner twice, she finally noticed the pastor sitting by himself at a table along the windows. The rest of the committee couldn’t be late, too… could they? Or had they all stood him up? Oh no. The meeting had been canceled, and she was the only one who didn’t know. That was almost worse than being late. Great! Now she was both the dunce who wasn’t in the loop and the one who was late. She deserved the prize for worst ever almost-first impression. Oh well. There was no hope for it. The pastor had spotted her. “Rejoice. Be glad. Rejoice. Be glad.” Hopefully, she was still far enough away that he couldn’t hear her muttered pep talk. He stood as she approached. Such a gentleman. He stared at her, a dazed look in his coffee-colored eyes. 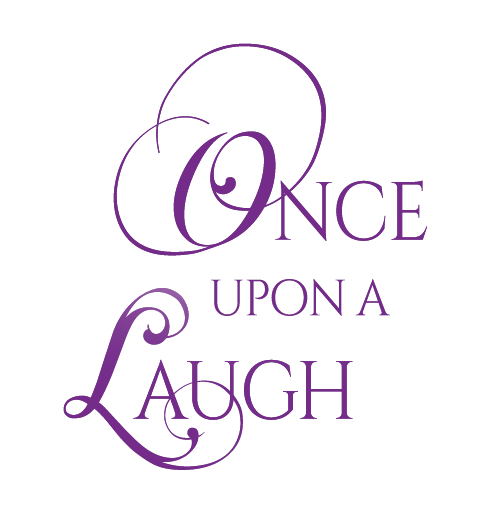 Click to find Once Upon a Laugh on Amazon. So tell me…what have you been reading this summer? So much great reading to be had. Thank you. I’m glad you could stop by today Mary! Hi Heather, thanks for sharing more about your books. My TBR pile is accumulating on my Kindle, but I have enjoyed the Tuscan Legacy Series, the Arcadia Valley series, to name a couple, plus many others. Hi Heather! Early summer I finished both the Tuscan Legacy series and the Arcadia Valley series. This month I started rereading Skye, an inspiring romance. 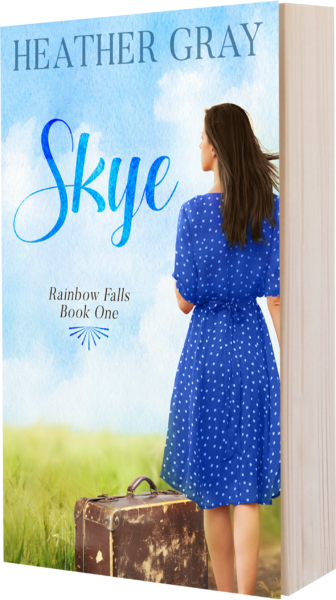 Skye’s name stuck in my mind because of the unusual spelling and I enjoyed the unique characters of the Rainbow Girls. So while I do not usually reread stories, I wanted to find out why I enjoyed the story so I can write a review. But unfortunately I was side tracked with other required reading – two mysteries (one for the monthly library book club and an ARC cozy mystery by Hope Callaghan). I also started reading Pepper Basham’s Jane, because I definitely need some laughs to keep my sanity while watching my 4 grandchildren (ages 13, 10, 4, & 18 months) Monday thru Thursday. The grandkids make me laugh. They only come to Oma and Opa’s to receive tons of love and for the delicious food. They never are fed over the weekend at home. Good line for a book. Thanks for your generous give away. Will be writing reviews for your new releases soon, when I have a sane moment. Best wishes. Enjoy your summer. Happy writing and reading. It sounds like your hands are more than full! I’m glad you’re having a fulfilling summer! I have thoroughly enjoyed A Tuscan Legacy this summer!!! I’m so glad to hear that Paula! All the authors appreciate your kind words. Thanks for the excerpt from your novella! I had pre-ordered it but haven’t gotten a chance to read it. Now I must push the collection up higher on my TBR list! Oh yay! I’m glad to hear that! I hope you enjoy all the fun books in the set! So many books and not enough time to devour them all. Have a blessed day. Thank you for stopping by today Kim! Oh my goodness! I loved this story! I loved the pastor for his patience. I loved Annie for her crazy sense of humor. I loved Beatrice for her honesty. It made me laugh out loud so many times. I can relate to Annie so much. I can just imagine how I would have felt in her shoes. Date a pastor? No way! thanks for sharing about these books. this summer i have read: Always and Forever, Back in the Saddle, Chasing the Wind, Who the Bishop Knows, A Light on the Hill, The Weavers Daughter, Amish Sweethearts, Their Daring Hearts, Keturah, Mail Order Brides Collection, A Moonbow Night, Love by the Letter, and others. I have left reviews for all. Phewww, I have been busy. I look forward to what the fall will bring. Ha! I love that you not only love to read,but also that you have the time to do it! Enjoy every moment! I’ve been reading A Tuscan Legacy this summer as well as several other books. 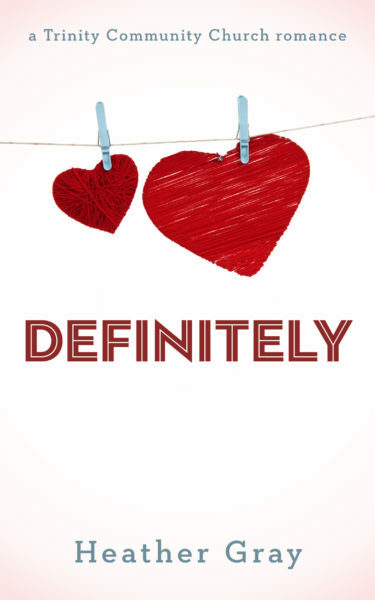 I’m excited to read Definitely! The excerpt definitely hooked me! You have good taste Melynda! And I hope you enjoy Definitely! Thanks for this info! soo many books I want to read! Thanks for stopping by today Jackie! I hope you have a blessed day! I’m actually reading more than usual. I’m shocked! In the past month I’ve read The Saturday Night Super Club, Darkwater Secrets, and The Indentured Queen. I probably read a couple more back in June, but I don’t recall what they were. It sounds like you’ve had a great summer of reading. Now that I only have 2 1/2 weeks before I’m back @ school, I feel summer slipping away with still too many books unread. This sounds like a fun series, Heather. Thanks for the excerpt. I’m currently reading Jane. Also sewing dresses for my granddaughters and going to the pool with them and my daughter. Enjoying being close to them. How fun! Going to the pool with kids is always an adventure! I’m glad you get to spend that time with them. Unfortunately, I’ve been too busy to read but I do enjoy reading mystery/suspense books. You have definitely piqued my curiosity with this excerpt. I have been reading a lot of books this summer and this one sounds like a great read Thank you Heather! I loved the collection. Pepper Basham’s was my favorite. I have been enjoying my time off to read as much as possible. Love the excerpt! I have my copy and am looking forward to reading it. If I am not too late, I am reading “A Defense of Honor” by Kristi ann Hunter and also “jimmy”, by Robet Whitlow, among others. I love finding about all the wonderful new books!